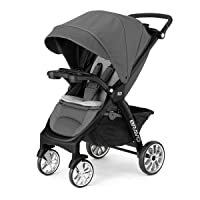 Home Best Baby Products Chicco Bravo Vs Bravo LE Quick-Fold Strollers: Who is The Better? Having a reliable stroller that adapts as your child grows is not just convenient, it is a must for parents nowadays. When it comes to great, reliable strollers, the Chicco brand doesn’t disappoint, with two models that easily beat out the competition. Comparing the Chicco Bravo vs Bravo LE isn’t easy – both models are strong and nearly identical. there are different features that you can have and the better of the two will simply depend on which features appeal more to you and your little one. Looking at the Chicco Bravo vs Bravo LE, there are not too many obvious differences on the surface. Both provide excellent comfort, convenience, and capability. Looking at some of the details however, there are differences to note; the main ones being the modes of use and brand compatibility. The Chicco Bravo stroller that will last you the longest will be the Bravo LE model. This model transforms to offer 3 modes of use: baby seat adaptability, a travel system, and a full stroller. 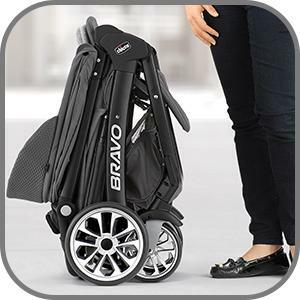 The Bravo model includes a free car seat adapter and offers a full stroller mode, but lacks the middle option of the travel system for children who are too big for a car seat, but not quite able enough for a full stroller setup. Between these two models is also the question of brand compatibility when it comes to accommodating the car seats. The Chicco Bravo model will work with any KeyFit seat while the LE is limited to the KeyFit30 model only. Additional differences between these two models include the weight of the stroller itself; the LE model weighs 23 pounds while its counterpart weighs 21 pounds. In regards to the support weight of the child, the Bravo model supports a child up to 50 pounds, while the Bravo LE’s design supports a maximum weight of 55 pounds. Aesthetic differences are also subtly present, with the parent tray for the Bravo LE sporting a zippered pouch while the Bravo model has an unzipped compartment. Lastly, while both sport the signature one-hand collapse and fold system, the Bravo LE can stand by itself when folded, when the Bravo model cannot. Partially responsible for this difference post-fold is the removable child tray that the LE model has, while the tray for the Bravo model simply folds into everything and is not removable. 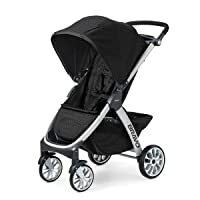 When it comes to looking at both the Bravo and the Bravo LE, both are excellent strollers with their own set of features and similarities that have propelled Chicco onto the top of the list for baby products. The LE model is one of the best investments for you and your child, with its most endearing feature being the design that has three transformative modes in one stroller. The baby seat adapter allows you to start using this stroller for a child as small as 5 pounds. Once your little one outgrows the baby seat, the travel mode adapts the stroller to accommodate the growing little toddler. Finally, for children up to 55 pounds, the full-on stroller mode will take them the final step before graduating from a stroller entirely. From a design perspective, the Bravo LE stroller is sleek and on point. The large basket found underneath the stroller is easily accessed from both the front and the back, sporting enough room for all of the essentials of travel and more. Adding to the essentials is a removable child’s tray and an adult tray that includes a zipped storage and cup holders. Bonus features for your child include the removable (and reversible) seat pad and a canopy with a flip-out visor extension. The overall usability of this model is just as sleek as the design itself. The signature 1-hand fold system is great and this model stands nicely by itself even when folded down. Linked rear brakes are fast to set and the height-adjustable handle is perfect for parents of all heights. Rounding out this model is the all-wheel suspension which leaves you and your little one ready for any terrain inside or out. There is nothing basic about this Chicco stroller model when it comes to comfort and ease of use. Sporting an Ombra color and subtle patterning, this is sure to make a statement wherever you take it. 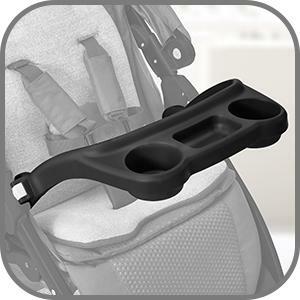 Abrand new stroller will include a car seat adapter and you will have the ability to use any KeyFit car seat. If your little one is out of a car seat already, this model works as a stroller for children up to 50pounds; it is sure to provide a full life of adventure. The Chicco Bravo sports the one-hand quick fold system which easily collapses this down for compact storage and transportation. It weighs just 21 pounds and has linked rear brakes that are activated with just a tap of your toe. To ensure a smooth ride for your little one, this model was designed with all-wheel suspension and auto-swivel wheels to take on any route. Additionally, the seat can go into an almost full recline (although the footrest doesn’t rise); keeping with comfort, this Bravo model also has an extra-large removable canopy. Maximum safety was also implemented with a sturdy 5-point harness. Extra perks for parents include an extra large storage basket that lives beneath the stroller and a parent tray that has 2 cup holders and an additional storage compartment. Final bonus? It has adjustable handlebars that can be set to 3 different levels. Choosing between the Chicco Bravo vs Bravo LE can seem pretty tough if you look at all of the great similarities shared between the two models. However, looking into the details can hopefully make your decision easier. In the end, both are incredibly designed models and there is really no loss either way you go. If you are starting from scratch and don’t have any car seat, the LE model is an easy choice – just so long as you purchase the KeyFit 30car seat. If you have been a long-standing Chicco fan, but own an older car seat model, the Bravo will most likely be a better investment. If weight is an issue, the Bravo model is the slightly lighter model of the two. Both sport the one-hand fold, but if you find yourself needing a model that stands alone once folded, the Bravo LE is the way to go. Chicco strollers are highly valued and for many reasons – the Bravo and the Bravo LE models are no exception. Choosing the right one for you and your family will be an easy choice, knowing that either way, you will end up with something that is sturdy, sleek and easy to take anywhere.